(16.2%, barrel sample July 2009) – this wine has a very deep colour and an underlying weight and depth of flavour allied with complexity and richness. Less spicy than the cooler years, it has powdery tannins and sweet dark fruits which combine in this fairly intense and (as yet) closed expression of the terroir. (Sampled May 2017) – a stand out favourite vintage which has developed into the unique formidable wine it promised to be. This complex, full bodied wine keeps on giving with soft, powdery tannins and silky mouthfeel. 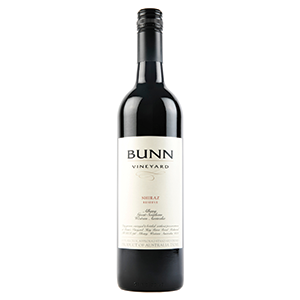 Bunn 2008 Shiraz continues to delight.